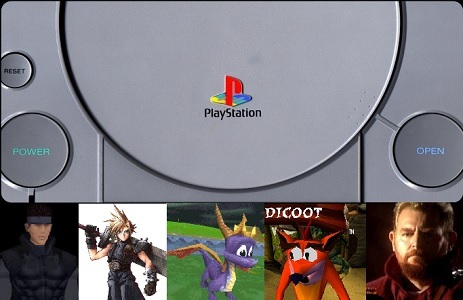 Back in 1994 /1995 when the first Sony Playstation Console was launched, there were no big new game characters to use as a mascot like Mario or Sonic, but during the next years, a ton of new video game characters were designed on and for the Sony Playstation and its audience. There were the new platformer mascot characters like Crash Bandicoot, Gex and Spyro, but also many much more mature characters like Solid Snake in Metal Gear Solid or Jill Valentine as part of the first Resident Evil crew. Cloud Strife and Sephiroth from Final Fantasy VII were first seen on the Playstation, just like many more role-playing games characters who are also known till today. Also really worth mentioning is Lara Croft from the Tomb Raider series. While the first TR was released a few weeks before on the Sega Saturn she got her popular status more or less because the 5 Tomb Raider games on the first Playstation.